Many of America’s largest cities are facing an affordable housing crisis. In particular, some cities on the West Coast and in the Northeast have seen skyrocketing rental rates and home prices in recent years, as the growing demand for urban housing has not been equally matched by increases in supply. While the supply side of that equation is complex and unique to every city, the growing demand can basically be boiled down to the fact that (aside from their expensive housing) these cities are desirable places to live. Buying a home? Use SmartAsset’s mortgage calculator to find out what your payment will be. What makes them desirable? That of course is a highly subjective question, the answer to which varies from person to person, but a number of overarching factors are undeniably important. By comparing the home values projected by the model with actual home values in each city, we can get a sense of which cities may be overpriced and which cities present a relative bargain. In other words: which cities are better places to live than their home values alone suggest? Is NYC worth the price? Here are a few things to know about moving to New York. Bay Area: overpriced. Make no mistake, the Bay Area is a great place to live. Nonetheless, according to our model the quality of life in cities like San Francisco and San Jose does not merit the insane home values. In San Francisco, for example, the actual home value is more than $850 per square foot. Our model suggests it should be closer to $560 (which would still make it one of the most expensive cities in the country). Bay Area cities account for three of the four most overvalued cities in our analysis. Pennsylvania cities are a bargain. 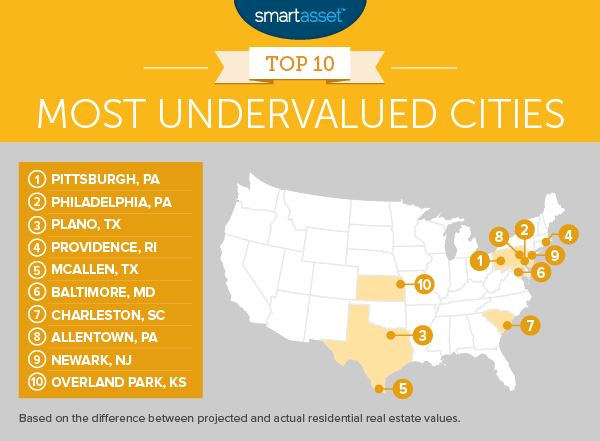 The Keystone State is home to three of the top ten most undervalued cities. Our model reveals that real estate values in Pittsburgh, Philadelphia and Allentown are lower than they should be based on livability alone. In 2015, home values in Pittsburgh averaged less than $80 per square foot. That means a 2,000 square foot home would be expected to cost, on average, less than $160,000. For that money, Pittsburgh residents have access to fairly good schools (the graduation rate at Pittsburgh School District is over 75%), a strong economy (unemployment in Allegheny County was less than 4% in December 2015) and plenty of things to do (the city’s concentration of dining and entertainment ranks in the top 25 of the 200 cities we considered). 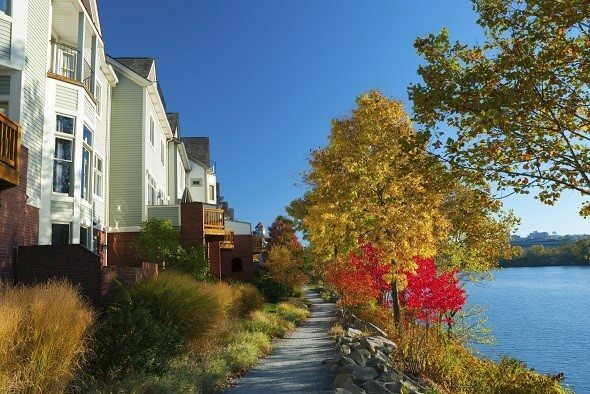 Our model found that based on quality of life alone, the home value in Pittsburgh should be closer to $225 per square foot. That is more than $150 higher than the true value per square foot, which makes Pittsburgh the country’s most undervalued big city. We should note, however, that people may be catching on. As of this writing, Zillow rates Pittsburgh’s housing market as “hot,” and prices are rising. In recent years, the urban cores of many cities have seen a renaissance of sorts. Young adults in particular have shown a preference for dense, walkable cities. This has been one factor (among many) leading to increasing home prices in places like San Francisco, New York and Boston. Philadelphia is one of the most walkable cities in the country, with a Walk Score of 77. Yet home values in the city lag behind those in the places mentioned above. Our model projected a home value per square foot for Philadelphia of $228.06. The average value in 2015 was slightly more than $90 and is currently about $92. 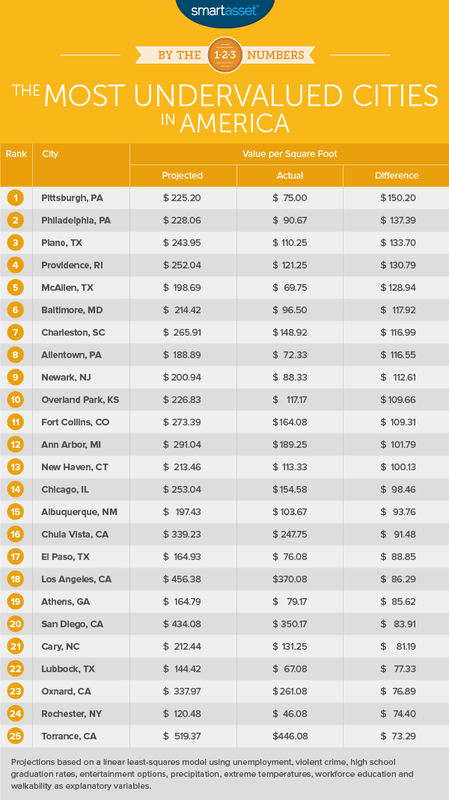 Learn more about the true cost of living in Philadelphia. Plano and the rest of the Dallas area have been experiencing a boom in recent years and a closer look at the numbers reveals why that might be so. Plano has excellent schools, with an area high school graduation rate of 95%. It is also relatively safe, with a violent crime rate of just 141 per 100,000 residents. Lastly (and perhaps most importantly) it is located in one of the strongest metro area job markets in the country, with unemployment of less than 4%. Nonetheless, home values in Plano are moderate on a per square foot basis. Our model projected home values of $243.95 per square foot based on quality of life factors alone, yet the actual home price is closer to $110 per square foot. According to our model, the home value in Providence should be about $250 per square foot based on the quality of life in the city. Especially notable is the city’s high walkability – with a Walk Score of 76 it ranks seventh out of the 200 cities in our study. Yet, the current home value per square foot is about $120, less than half of that projected value. This south Texas city is one of the safest cities in America, with a violent crime rate of just 126 per 100,000 residents. The warm, dry climate in the “Texas Tropics” may also appeal to people who are tired of the cold, gray winters of northern locales. Yet the median value per square foot in McAllen was less than $70 over the course of 2015. Our model projection, based on the quality of life in McAllen, values living in the city at closer to $200 per square foot. In the market for a mortgage? Compare mortgage rates with our free tool. According to Zillow, home values in Baltimore have increased by more than 5% over the past year. With a Walk Score of 66, it ranks as the 15th most walkable city in our study. It also has a fairly mild climate, with an average of just 50 extreme temperature days per year (days where the max is less than 40 degrees or the high is more than 90 degrees). Compare that with Chicago, which has 90 such days per year. SmartAsset’s model found that, based on the eight quality of life metrics we considered, the median home value per square foot in Baltimore should be about $214. The actual value is just under $100. What’s not to love about Charleston? It has warm weather, beautiful beaches and plenty to do. Its 194 dining and entertainment establishments per 100,000 residents ranks 16th of the 200 cities in SmartAsset’s analysis. Its violent crime rate of 194 per 100,000 residents is likewise much lower than average. Yet, compared to many cities with similar attributes, Charleston is a bargain. The median home value per square foot was less than $150 on average in 2015 (it is now about $156). Our model projects that based on the standard of living it should be more than $265. Located in the picturesque Lehigh Valley, Allentown is Pennsylvania’s third largest city. The homebuying market in Allentown is slightly less expensive than that of either Pittsburgh or Philadelphia. It is somewhat more walkable than Pittsburgh, with a walk score of 65, and has a far lower violent crime rate than Philadelphia (527 violent crimes per 100,000 residents as compared with 1099 in Philadelphia). Our model found that Allentown is undervalued by about $116 per square foot. The largest city in New Jersey is often overshadowed by its neighbor to the east. Our model projected a home value per square foot of $200.94 in Newark, still well short of the projected value for New York City ($357.81). Given current actual values, however, Newark appears to be the bigger bargain. In 2015, home values in Newark averaged about $88 per square foot, a fraction of the more than $412 per square foot value in NYC. Great schools, a strong economy and low crime rates: on these metrics, Overland Park rates among the best cities in our study. Its average high school graduation rate of 95% ranks sixth out of the 200 cities we analyzed. The county unemployment rate, which is less than 3%, ranks as the fifth lowest in our study. In sum, our model found that the Overland Park’s value per square foot of about $117 should be closer to $227 based on the city’s livability. The R-squared for the model is 0.68, meaning these metrics can explain 68% of the variation in home values between cities. By plugging in the numbers for each city in our study back into the model, we can then find a projected value and a residual (the difference between the projected value and the actual value). That residual represents the amount the city is over- or undervalued. As described above, the model is based purely on quality of life metrics and does not take into account a number of factors or circumstances that will have an effect on home value. Among the factors left out of our analysis are the rate of new-home construction, the relative cost of rentals and the rate of population change. The projected values are therefore not a prediction; based on this data we cannot say whether prices in any particular city will rise or fall. Data on violent crime rates comes from the FBI’s Uniform Crime Reporting tool as well as local government websites. Data on average high school graduation rates comes from the Department of Education’s EdFacts website. Data on the number of dining and entertainment establishments comes from the U.S. Census Bureau’s Zip Codes Business Patterns database. Data on the average number of precipitation days (the number of days per year with at least 0.1 inches of precipitation) comes from the National Oceanic and Atmospheric Administration, as does data on the number of “extreme temperature days.” That metric totals the average days per year in which maximum temperatures are lower than 40 or higher than 90. Data on the percentage of the population with a bachelor’s degree or higher comes from the U.S. Census Bureau’s American Communities Survey. Data on unemployment rates comes from the Bureau of Labor Statistics. Data on each city’s Walk Score comes from WalkScore.com. Data on home values per square foot comes from Zillow. We used Zillow data to perform our own calculations. We averaged monthly home value per square foot figures over 2015 to produce a 2015 average home value per square foot. 1. For example: Martin Shields, Stephan J. Goetz, and Quiyan Wang, “Out-Migration from the Northeast U.S.: The Relative Roles of Economic and Amenity Differentials,” Amenities and Rural Development, 2005. 2. The linear least-squares method minimizes the differences between the values projected by the model and the actual values (these are called residuals). It creates the best possible description of the data using the given variables and assuming linear relationships.